There's tons to do in Red Dead Redemption 2, but does every activity and mission count towards the 100% completion total? While there might be a huge number of activities and missions for you to complete in Red Dead Redemption 2, not everything counts towards your overall completion percentage. In this Red Dead Redemption 2 completion checklist guide, we'll be going over everything that you actually need to do in order to fully complete Rockstar's massive game. If you instead need any other information on Rockstar’s latest game, you’ll want to head over to our Red Dead Redemption 2 guides hub. It’s on this page that you’ll find a complete list of tips and tricks, as well as a full index of in depth guides for the huge game. Just below, we’ll be listing out everything that contributes to the 100% completion statistic in RRDR2. This list is very much a work in progress, and we’ll be updating it with more details whenever we uncover any new contributing factors. 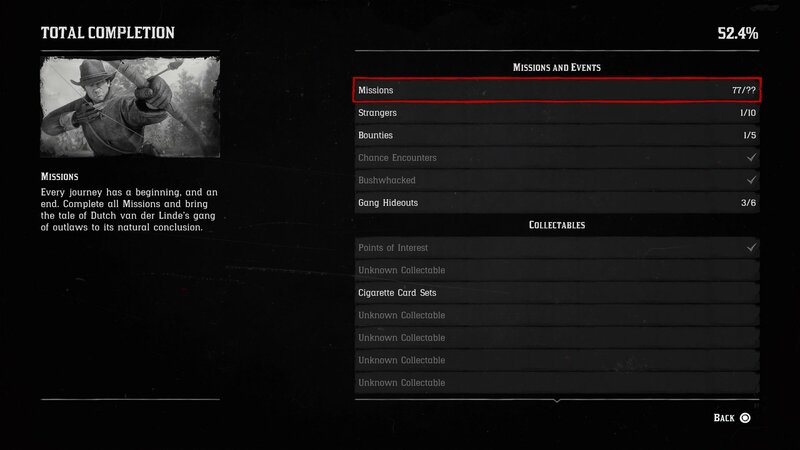 Complete all Mission - There are at least 85 story missions in Red Dead Redemption 2. Strangers - Interact with at least 10 Strangers. Bounties - Complete 5 total Bounty missions. Chance Encounters - These are the mini encounters that happen randomly around the map, and you need to complete 25 of them. Bushwhacked - Encounter 1 gang ambush. Gang Hideouts - Unlock all six hideouts for the Dutch Van der Linde gang. Points of Interest - Find 1 point of interest out in the world. Cigarette Card Sets - Collect 1 complete card set. Treasure Hunter - Complete 1 treasure hunter chain. Dreamcatchers - Find all 20 Dreamcatchers throughout the world. Animals - Find and study all 50 animal species. Equipment - Obtain 10 pieces of equipment in total. Fish - Discover 10 species of fish. Gangs - Encounter all 6 enemy gangs. Horses - Discover 10 breeds of horses and study them. Plants - Collect 20 different types of plants. Weapons - Use at least 28 different types of weapons. Player - Max out your health, stamina, and deadeye meters. Horse Bonding - Reach level 4 bonding with any horse. Challenges - Complete all 9 Challenges. Shacks - Discover 5 Shacks. Legendary Animals - Track and kill any 5 legendary animals. Table Games - Play one game each of poker, blackjack, dominoes, or five finger fillet. Ranters, Ravers, and Campaigners - Find and interact with 5 of these people found throughout the world. Bath - Take 1 bath. Show - Watch 1 show. Theater - Visit 1 theater. Recipes - Craft 1 tonic, type of ammunition, hunting item, horse care item, and weapon item. Robberies - Complete 1 coach, home, shop, and train robbery. As we mentioned previously, these are all the tasks we’ve uncovered so far that count towards your 100% completion in Red Dead Redemption 2. Should we uncover any more, we’ll update the list above straight away. Now that we’re done here, you can continue ahead to any of our additional guides on Red Dead Redemption 2. You can either check out our Red Dead Redemption 2 cheats guide, or our complete Red Dead Redemption 2 legendary fish guide for more.